Could the Ravens really draft a running back in the first round? The answer: Yes, but it’s not likely. The Ravens could absolutely make a shocking selection come draft night. Baltimore could pass over drafting a good player at a position of need in order to select a player they see more value in. There is a precedent for this. In 2017, the Baltimore Ravens passed over both tight end, OJ Howard, and inside linebacker, Reuben Foster to select cornerback, Marlon Humphrey. While both Howard and Foster played positions the Ravens were in need of an upgrade at, Baltimore ultimately drafted the best player available in Marlon Humphrey. At the time, the pick surprised most. Baltimore had no urgent need at cornerback. The team already had Jimmy Smith, and just signed the veteran Brandon Carr. But hindsight is 20-20, and most Ravens fans now agree the pick was excellent. But at the time, many were disappointed. The same situation could happen again in 2019. The Ravens could see receivers like N’Keal Harry or A.J. Brown available at the 22nd pick, but choose to pad a positional group with the best player available. If the Ravens were to add a running back in the first round, it would have to be Josh Jacobs. The current consensus is that Jacobs is the only first-round worthy running back, and should be a late-round pick. How fitting would it be for Eric DeCosta, in his first year as general manager, to ensure continuity by picking an Alabama player with his first pick? This scenario is plausible, but I don’t expect it to happen. This draft class appears to be deep at running back, and the Ravens can find a bargain player in the later rounds. The Ravens also have three running backs on the roster built to work with the system in place. Gus Edwards succeeded with Lamar Jackson at quarterback last year because his running style perfectly matched Lamar Jackson’s. The read option allowed for Jackson to either let Edwards run up the middle or for himself to take off towards the sideline. This balance sliced defenses into pieces. Mark Ingram is the same type of runner. The only running back the Ravens would replace is the third string, Kenneth Dixon. Although Dixon is extremely talented, his injury history is alarming. Baltimore could choose to pick a more reliable running back to replace him, but likely not in the first round. It is more realistic for the Ravens to draft Damien Harris. Harris saw more production than Jacobs did during his time at Alabama and is currently projected to be a third-round pick. The Ravens could conceivably address the wide receiver position in the first round, or trade back to acquire extra picks. Baltimore has two third-round picks and could spend one on Harris. In short, it is possible that the Ravens could select Josh Jacobs with the 22nd pick, but not likely. The addition of Mark Ingram and the glaring need at wide receiver make this hypothetical pick less likely than before. Baltimore could add still add a great running back in Damien Harris. The cost would be significantly less in the third round. 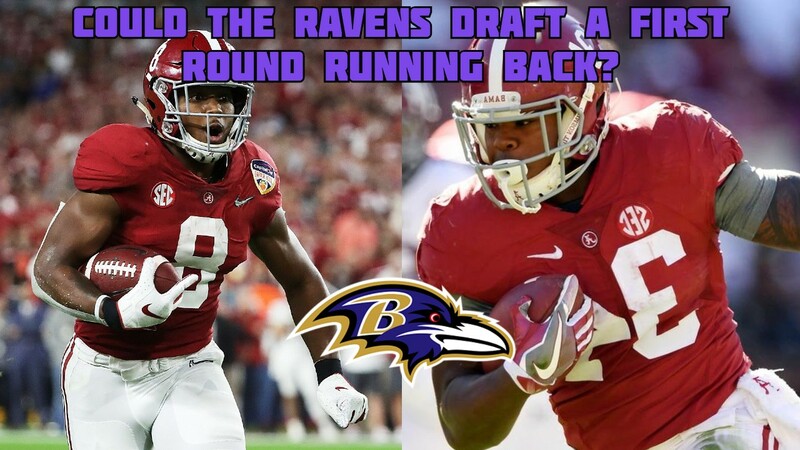 The #Ravens are taking a hard look at some top RBs, hosting both #Bama standouts Damien Harris and Josh Jacobs, source said. Jacobs flies in today and has dinner with the staff tonight before his visit tomorrow. Harris is there now, then flies to Dallas tonight to see #Cowboys. Previous Previous post: Where is Brent Urban?